The white grape comes from Greece, possibly from the island Santorini, Synonyms are Adani, Aedano Leyko, Aïdani Blanc, Aïdani Lefko, Aspaedano, Aspraïdano and Moschïdano. It is believed that the variety (among many others) for the production of the famous Malvasia wines was used as early as the 13th century by the historic Greek port Monemvasia shipped out or exported. For a suspected Turkish descent genetic evidence is missing. According to done in 2007 DNA analysis is the red variety Aïdani Mavro not as long suspected to be an independent variety, but a color mutation by Aïdani Aspro (or vice versa). The late-ripening vine is prone to fake and genuine mildew, but resistant to drought, It produces a white wine with low acid and alcohol content and tropical fruit aromas. The variety is on the Cyclades cultivated, where they as a Verschnittpartner of Assyrtiko and Athiri Aspro in the white wines of Paros and Santorini is used. 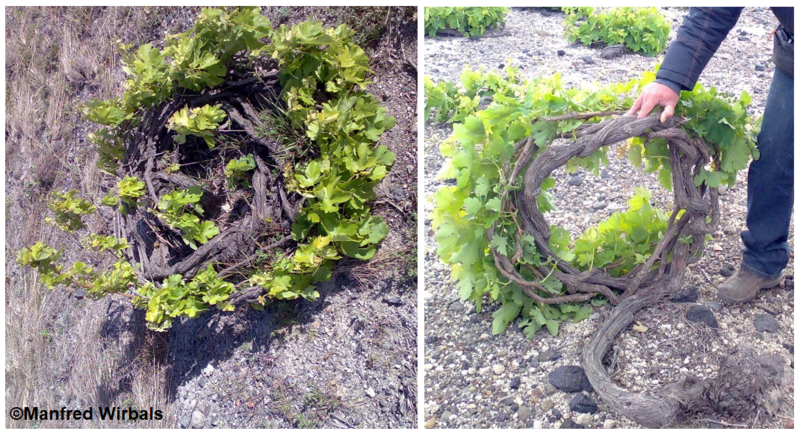 Here are the vines ungrafted planted and in the traditional form of education Kouloura behaved. The shoots are circular in the form of a nest woven to protect the fruit from the wind. In 2010, however, no stock was reported (Kym Anderson ). This page was last modified at 7 February 2018 at 08:23.